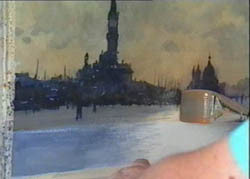 Robert Wade concentrates on three main areas of watercolour painting: the all important use of tonal values, the use of colour, and the way to approach figures in a painting. 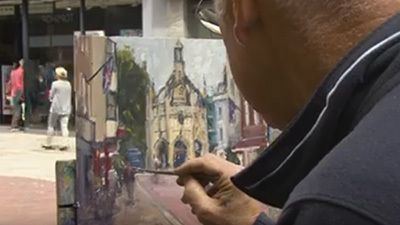 With exercises to practice, clear instruction and several finished paintings, Robert's exciting and creative demonstrations will provide inspiration for all watercolour painters. Filmed in the UK, both in the studio and around the Cotswolds. 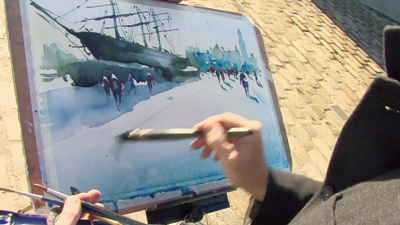 Robert Wade's final remark in the entertaining and informative video Watercolour ... Wade's Way, identifies a quality he maintains is required by all aspiring artists: a strong right hand. Just as I did, you may speculate on the use of a 'strong right hand': to wield the brush or to carry equipment on and off site, you may think. But no! 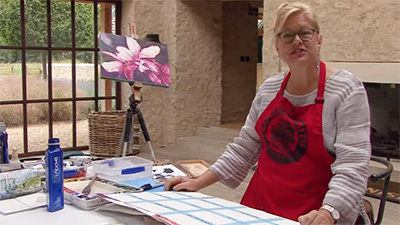 Wade explains: "If you've got a painting that doesn't really work ... take that strong right hand and do this with it", and so saying, he rips one of his watercolours into pieces! The phrase 'strong right hand' might be said tongue-in-cheek but there is a serious lesson here: to be honest enough to admit that a piece of work may not have reached the standard you hoped for and not to be too precious about these steps along the way. Of course, the trick is being realistic about that standard and having the resolution to do better. 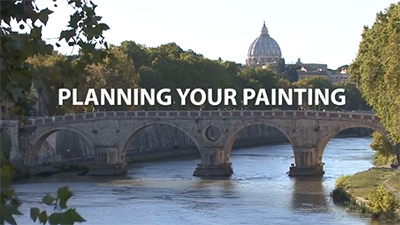 For many leisure painters, the great problem is just how does one do better? More often than not, the answer lies in a simple yet significant discovery, and I suspect that Robert Wade's insistent dialogue and instruction on the importance of tonal values will point the way for many. The play of dark against light and light against dark, a means of establishing the effect of "air all around ... as though the subject is living and breathing", as Wade calls it, is the cornerstone of his painting and teaching. 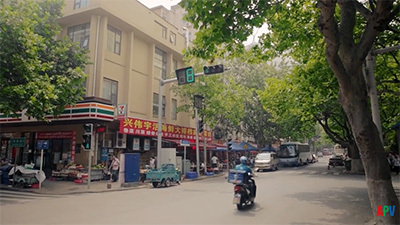 The video opens with a simple, but effective demonstration of tonal values and passes smoothly and assuredly to an understanding of colour tones. It couldn't be clearer and the transition from instructional exercises to more finished work painted on site is made with consummate ease. 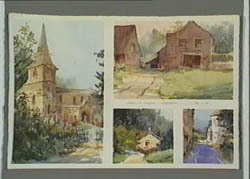 Along the way, Wade introduces some interesting and useful ideas - the merits of using a sketchbook, the vibrancy achieved by mixing colour on the paper rather than on the palette, the use of separate frames on a single sheet of paper which help to determine composition; an effective means of representing figures. 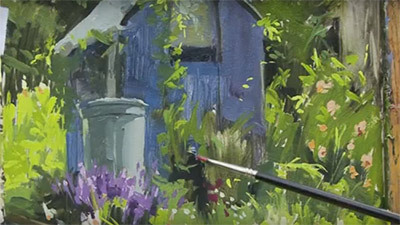 All in all, this video could be a revelation to those leisure painters looking for help and inspiration and, combined with Robert Wade's informative commentary, it will be a highly practical and valuable asset to the watercolour painter's armoury. 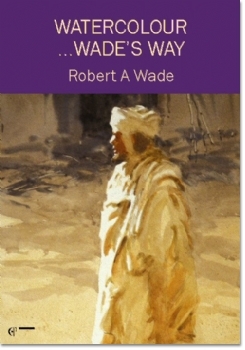 For plenty of ideas on how to revitalise your watercolour technique try Watercolour Wade's Way by Robert Wade. 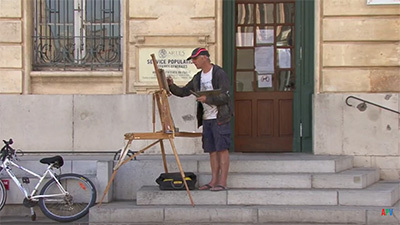 I found this an interesting and memorable video, not just because of a rather unusual and confidence-boosting simple method of approaching figures, affectionately called 'Bob's blobs', but also because of the excitement engendered for the "give it its head mixing and merging" approach to colour washes. There is good instruction here in tonal values, cultivating the sketchbook habit, painting figures and, above all, working with some freedom with wash over-wash techniques.